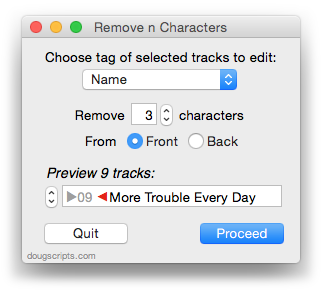 Download hundreds (479 and counting) of AppleScripts for Apple's iTunes that will help make managing your digital music collection easier and more fun! AppleScript is a simple Macintosh-only programming language that can control and automate actions on your Mac. AppleScript is already available on your computer as part of the Mac OS and many popular applications can be automated using AppleScript scripts. Scripts written for iTunes can manage files and track information, create playlists, interact with other applications, perform innovative tasks, and handle many kinds of chores which otherwise would be repetitive, laborious, and/or time-consuming. Cool! Where Do I Start? Or use the search box at the top of every page to try and find something specific. Not sure how to install AppleScripts? Here's a Download/Installation FAQ & Video. Check back often or follow me on Twitter @dougscripts, my YouTube channel or on Facebook, or subscribe to my RSS blog feed and 30 Most Recent Scripts RSS feed to stay notified about new and updated scripts and info. Dr. Drang has posted some thoughts and questions about the future of automation on the Mac. I just posted an update to M3Unify. Just a couple of minor fixes but if you’re registered its always good to have the latest version. 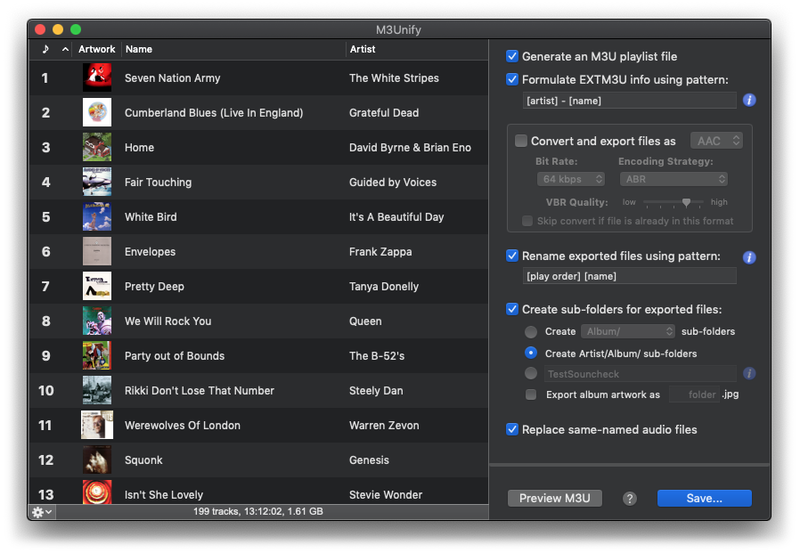 M3Unify is a flexible file exporter and M3U playlist creator that will allow you to sensibly off-load copies of your iTunes songs to a user-chosen location—separate folder, external drive, USB thumb drive, SD card and so on—the way you and your portable or car audio player want. Download the free trial from this page and then purchase a registration for $5.00. And many thanks to M3Unify’s current users! 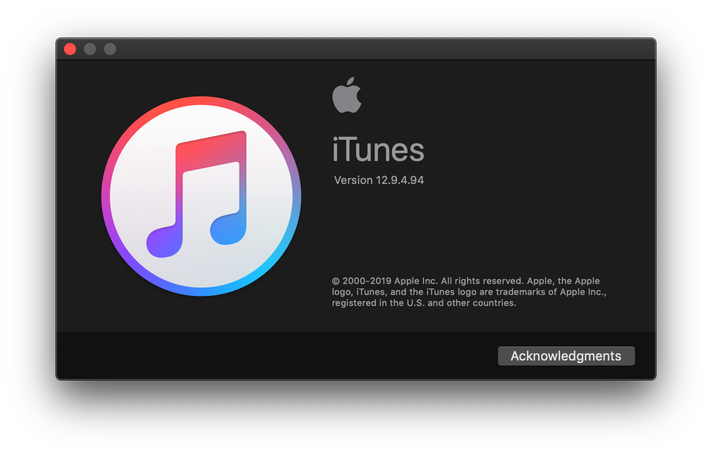 Apple has released iTunes 12.8.2, an update for users who have not updated to Mojave (macOS 10.14). If you don’t see it in the App Store app, here is a link to a stand-alone version. It apparently fixes some issues with AirPlay and, of course, makes the obligatory performance enhancements, and so on. 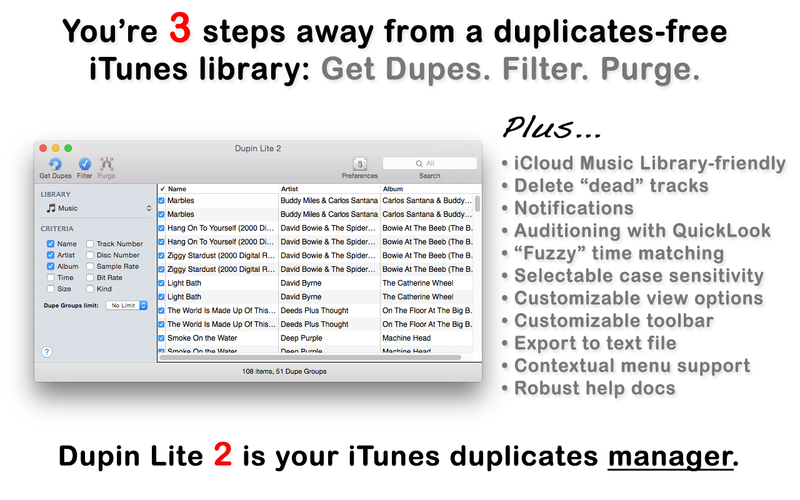 Dupin Lite 2 has been updated to version 1.4.0 and is now available on the Mac App Store. 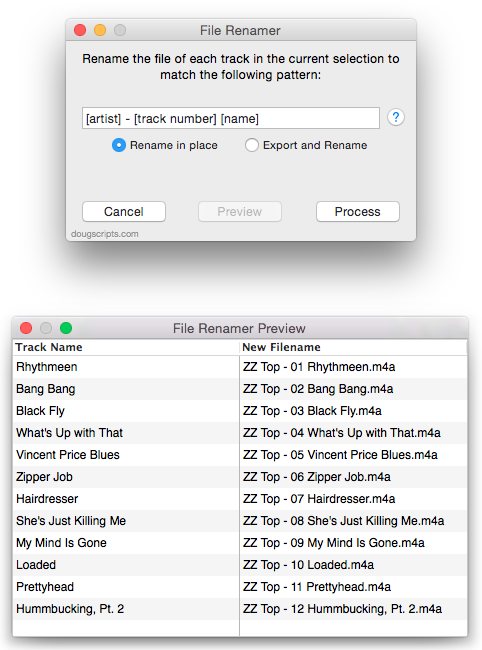 Dupin Lite 2 is a “lighter” version of my iTunes duplicates-managing app Dupin. It has fewer power-user features and essentially gets right to the business: find dupes, filter for Keepers, Purge. This latest version accommodates Dark Mode under Mojave and adds some performance enhancements. 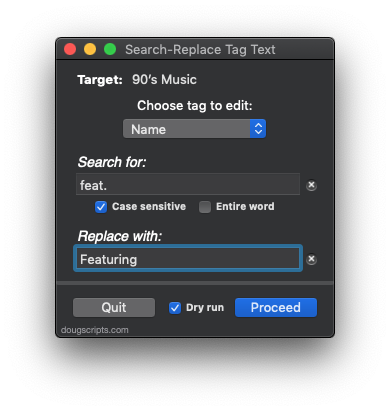 It would be great if clearing Up Next could be done via AppleScript. I have been a good boy.